As Home Inspectors, we are always seeing things we have never seen before. No matter how long we stay in this interesting business there will always be homes and construction techniques which amaze us. As for me, whenever I think I have seen everything, something strange and different comes up. Approximately twelve thousand years ago, the last modern ice age receded from North America. Mammoth glaciers carved huge ridges and hills from Minnesota to Wisconsin to New York and Massachusetts. Left in its wake were large boulders - some of which were pounded into cobblestones, small fist-sized stones or a stone which can be held in one hand. As the ice receded north into Canada, large bodies of fresh water we know as the Great Lakes were left behind to polish these cobblestones for an eternity. Sometime around 1825 near Rochester, New York a country mason began collecting these small "cobblestones" and built walls with them. Soon cobblestone homes were popping up all over western New York and by 1830 it was an accepted construction method. As a result of an inexhaustible supply of cobbles, this trade spread fast throughout the Great Lakes region. The homes were built with materials harvested from nearby fields and forests. A cobblestone wall means the home was 100% hand-made from bottom to top. Between 1825 and the start of the Civil War, approximately 1000 cobblestone and mortar buildings were crafted in the northeastern United States. From its origin near Rochester, these buildings appeared to the west into Ohio, Michigan, Wisconsin, Illinois and even some in Canada. They also dot the landscape to the east across New York state. I have been privileged to inspect 30 of these unique structures in my career. Many cobblestone buildings have been remodeled and updated and just as many still have the same dirt on the floor from 1825. They come in many sizes - from very tiny to large 3000 square foot homes with several additions. 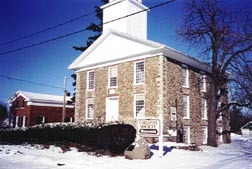 Most are residential homes, but some are commercial office buildings, churches, schools, museums or just plain unoccupied historical buildings. No two of these interesting buildings are made the same and if we could go back in time and talk with these masons, we would find that they were very proud of their work. Many guarded their techniques with their lives. Special tools were crafted to make their own unique finished look. Of all the cobblestone buildings that I have inspected, only one had major structural failures - most have stood the test of time. The awful winter weather of western New York and the northeast can bring disastrous results to masonry products. Each mason had his own style of constructing the actual mortar joint. Some of the mortar joints were trawled to a point with 6 sides around a single stone producing a hexagon look. The stones were laid in rows using natural lime mortar. The reason many of these structures still remain today is the quality and hardness of the mortar and the way in which it was applied. Natural lime mortar was made from limestones mined from quarries located near the construction sites. The lime was mixed with sand and water to specific formulas. Many differences of opinion exist as to which formula worked best. The actual process of making the lime powder was exhaustive. First the lime was pounded into small pieces and burned in a lime kiln. Water was added and the mixture was allowed to age from several weeks to as much as a year before it was used. How well the mortar held up under weather depended on the quality and purity of the sand and limestone used as ingredients. 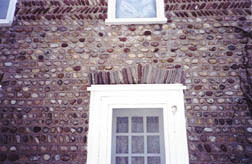 Cobblestone buildings can be framed as a wall only or as a veneer to wooden framing. Remember no two are the same. Most stone walls range from 12" to 24" thick. They begin with what is called a rubble wall of stones laid first with no particular pattern. This beginning wall can be made of various sized stones, usually larger than the fist-sized cobblestones. Most of the time records show only one or two masons worked on a home at the same time. Too many workmen would mean the walls might go up too fast and not have time to dry properly causing early failure or even a collapse. Usually it was best for one mason to work methodically giving all mortar time to set up properly. Besides, most of these craftsmen were not eager to teach their trade to others. Between the rubble wall and outer wall is where most failures occur. Water penetration and the freeze and thaw cycles will cause the outer cobblestone wall to crack and become loose which would eventually cause movement and failure. This is why when modern restoration repairs are made most of the outer stones are removed to allow the rubble wall to be restored providing a sound base for re-installation of the cobblestones. Several of these homes, but not all, have the foundation as the beginning of the stone wall which indicates the subsequent wood floors do not sit on the foundation. Any negative grading situations or foundation damage can be seen as affecting the whole structure. The floor joists are usually mortared into the wall indicating foundation movement would be joist movement. Uneven floors with some extra slope are not uncommon. On-going pointing maintenance is essential for this type of building. Anyone who would live in a historical home like a cobblestone, would most likely be interested in preserving the original look and at the same time make modern upgrades. Each one of these homes has a slightly different shade of mortar. Matching the color closely makes a much better result to pointing maintenance. Cracks are the single most evident sign of failure. Pointing will seal out moisture to a cracked area but will not insure against future failures. Usually small cracks pose only normal maintenance concerns. Cracks in excess of 1/16" and those that form a circle or show differential shifting are the ones to direct your attention to. Any bulges, bowing or loose and missing stones indicate a failure of the inner rubble wall which is pushing on the outer veneer of cobblestones. The earliest cobblestones structures had the corners the same as the walls, a rubble wall with outer cobblestone veneers. These were prone to failure from having to turn the corner. Later techniques saw large square pieces of lake stone used to give the corners improved support. The finished cobblestones came in several varieties. Red sandstones which had been polished by the lake were used in several ways. A herringbone pattern was popular. Horizontal stones laid flat were also often used. It is always important to pay particular attention to very old floor joists and support beams, as well as exterior wood trim and moldings. If you mix 175 year old wood with a stone foundation you are bound to find some decay. What makes this type of a home inspection challenging is that many of these homes have been added onto with modern construction and methods. You are constantly switching back and forth in your mind from 1825 to the 1900's. A cobblestone home can be very drafty and cold. As we all know masonry products are poor insulators and transfer cold temperatures easily from outside to inside. Insulation upgrades are always suggested. When stone walls are stripped of plaster and drywall on the inside 6" of unfaced fiberglass can be added with a covering of high "R" sheathing or Dow board prior to the installation of drywall. Of the 1000 cobblestone buildings remaining, approximately 90% are within 75 miles of Rochester, New York. But, if you have the chance to inspect a cobblestone in Chicago, Minneapolis, or wherever, be prepared to enjoy yourself because these beautiful buildings are a testimony to the ingenuity of our forefathers. The Civil War generally marked the end of cobblestone construction in the northeast. Modern wood balloon framing was gaining in popularity. Modern bricks were being mass produced and Portland cement would dry much faster than natural lime mortar. A cobblestone building simply became too costly and time consuming to construct. I try to take a picture of each cobblestone that I inspect to hang on my office wall. Like so many other aspects of modern craftsmanship, this is a long ago lost art.